Forage & Flower is expanding with a 2nd store….in Newnan, GA! And we’re not talking about the cello-wrapped unnaturally colored flowers from the grocery store. A truly stunning arrangement with designer blooms will last longer than grocery store flowers and look noticeably better. Our take on florals is simple - we source the best blooms and containers so we can create high-quality arrangements for our customers. Head to our website for painless online ordering, or give us a call (770-683-3881) if you’re looking for a more personalized bouquet. Ah, the timeless Valentine’s Day gift. And while the saying goes, “diamonds are a girls’ best friend,” it’s easy for jewelry to become stale. Try shaking things up with a statement piece from Julie Vos! We started carrying the line this year, absolutely love it, and think your S/O will, too! If you need assistance selecting a piece for your special someone, please feel free to come into the shop or call us - we would love to offer suggestions! If you prefer to gift your Valentine something with a bit more longevity than a floral arrangement, consider a planting! The perfect way to spruce up any room and add a pop of color to your home, we have a variety of plantings available on our website, or you can give us a call to inquire about a custom planting. From orchids to succulents to ferns, we can recommend something for anyone - even the self-proclaimed plant killers out there! For the plant killers who are past the point of no return (we all have different skill sets, right?? ), we even offer beautiful and realistic faux orchids and succulents. We also have a highly curated selection of giftable items available in our Serenbe shop - call or come by (9206 Selborne Lane, Chattahoochee Hills, GA) today to shop for Valentine’s Day & more! 1) Decide on a budget. This is #1 because everything else will depend on where your budget is set. Sit down with your fiance and anyone else who may be contributing to your Big Day (parents, in-laws) and come to a conclusion on a number. To give you a point of reference, the average all-in cost of weddings we do florals/design for is between $80,000 - $100,000. That might sound like a lot (or not) but when you add up all the details that go into a wedding, you’ll see how easy it is to reach, and exceed, that number. 2) Decide whether or not you’ll hire a planner. Most planners offer either full or partial service planning to accommodate your needs. Think about your strengths and weaknesses - are you detail oriented and organized, with experience in planning events? Or maybe you work 60 hour weeks as it is and don’t know the difference between a plated dinner and dinner stations? Working with a planner you trust can be wonderful because they know your budget and vision and have the resources to make it come to life! Keep in mind that using a planner is an expense that not all budgets have room to include. However, we DEFINITELY recommend having a month-of planner, at the very least. You need someone to guide you through the rehearsal and make sure everything goes smoothly the day-of. And that someone should not be your second cousin, Rhonda. 3) Choose your vendors. Venue should be at the top of that list, because the availability of your venue will most likely determine your date. Venue, caterer, photographer, videographer, florist (that’s us! ), band/DJ, officiant. The Knot and WeddingWire are both really helpful when looking for vendor referrals! 5) Breathe. This time of engagement will fly by…try to enjoy it! Keep dating your fiance, make time for yourself, ask for help when you need it, and don’t forget to savor this time in your life. If you are ready to book your florist or want more information on our wedding services, please feel free to give us a call or visit our website…we would love to be part of your special day! Shopping for him…the nondescript, indecisive, not-sure-what-he-wants male. We’ve all been there and it is exhausting! Let’s try a change of pace - sit back and relax this year. We’ve got gifts for your man, covered…Because real men have house plants. 1) Airplant. Why, you ask? Because airplants are some of the easiest plants to care for. They look really cool and you can set them anywhere and let them be. Perfect for the man on the run who doesn’t have time to worry about a watering schedule. 2) Planted Fern. Any type of planted fern will be a welcome addition of green to any male residence. Depending on the variety of fern, the maintenance level is fairly low while the impact in a room is significant. Select a container to suit the personality of your man, and a fern to match! 3) Seasonal Door Wreath. Let’s be honest, not many men take the time to buy themselves seasonal door wreaths…Which is why you should do it for them! A wreath is a great accent to a front door, regardless of the time of year! Order a custom holiday wreath for your guy or order a more evergreen option to last through the winter months. 4) Terrarium. The perfect discreet houseplant for a man. It blends in to the surroundings, yet brightens up the room without being ostentatious. He’ll appreciate it’s simplicity and low maintenance care schedule. Let us know if we can help you with any special orders…happy shopping! Teachers, neighbors, dog walkers, coworkers, your favorite barista…the list goes on and on. We have all people in our lives who we want to recognize around the holidays but may not be on a super personal level with them. These gifts are a great way to show you care without having to worry about whether they’ll like the gift or not…we assure you, they will! 1) Succulent Garden. One of our most popular items! Incredibly easy to care for and very likeable…you may want to keep one for yourself! We have a variety of succulents and planters available in-store. 2) Hanging Terrarium. This little cutie is sure to put a smile on anyone’s face…even that cantankerous uncle who appears at Christmas dinner whether he’s invited or not…best to be prepared with a gift this year. 3) Hanging Bud Vase. We all understand that the holidays tend to call for an abundance of wine…what better way to put those empty bottles to use than to hang bud vases on them! 4) Lemon Cypress. 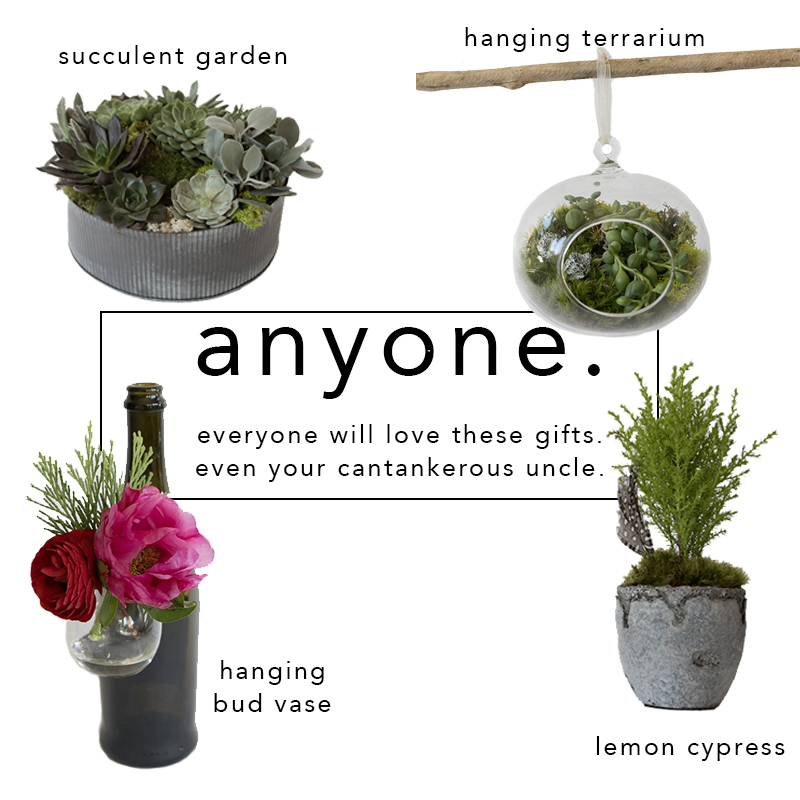 Available in 2 sizes or as a topiary, this gift will be loved by all who receive it. It is beautiful year round and is the perfect coffee table or mantel accessory. There you have it - surprise your Secret Santa with something more thoughtful (and well-received!) than a gift card this year. As always, feel free to contact us about custom orders or with any questions. The holidays are a magical time, full of time-honored traditions, loving get togethers, family gatherings, delicious food, and …STRESS. Time to take a load off and treat yo’self(!) with one of these gifts. 1) Fiddle Fig Tree. Very popular with interior designers right now, the fiddle fig tree is a beautiful addition to any home. It’s truly amazing what a pop of green can do to a room…give it a try and let us know what you think! Available in full size or mini. Contact us to order. 2) Designer’s Choice Arrangement. Our floral designers have your best interests at heart. We will always do everything in our power to give you the most bang for your buck and ensure you are satisfied with a textured, lush, and beautiful arrangement. The most timeless way to treat yo’self is with fresh flowers! 3) Flower of the Month Club Subscription. Every flower lover’s dream, this subscription includes a gorgeous arrangement delivered to you each month, plus a beautiful seasonal container 4x per year! If you don’t feel like gifting this generous subscription to someone else, it definitely has your name written all over it! 4) Birch Container. A lovely addition to your planter collection, the birch container adds a winter-y vibe to your planting. Lemon cypress topiaries looks amazing in this planter, as do orchids and ferns…so many options, you may want more than one! The gift that keeps on giving is sometimes a gift for yourself…and we support that. Happy shopping!